Brantholme Guest House sometimes limits bookings to 3 or more days. En suite bathroom with bath and separate walk in shower. Reduced prices for children provided there are two adults in the room. Views over Ambleside village to the Lakeland Fells beyond. room 2 sometimes limits bookings to 3 or more days. Space for an additional bed (charges apply). room 4 sometimes limits bookings to 3 or more days. 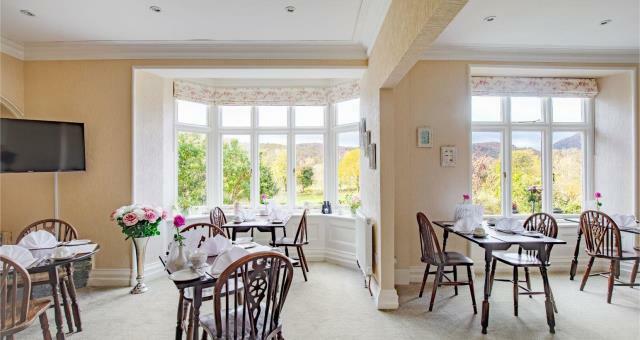 Family owned and managed Bed and Breakfast in a central, but quiet location in the village of Ambleside. Prime example of a Victorian Villa sympathetically modernised in the Summer of 2014 to a very high standard. Stunning, unobstructed views of the Lakeland Fells from the front of the building and wonderful views of Ambleside village and the Lakeland Fells beyond from the rear of the building. Offering accommodation comprising of 7 Standard and Superior bedrooms, each room features super-king size beds, ensuite with separate bath & shower, 40" TV with FreeView, Free Internet Access and Mini-Fridge. A ground floor room is available, 3 first floor rooms and 3 second floor rooms. Superior rooms have more space and some can accommodate additional bed. Free, private parking is available. Dog friendly. By car - travelling South on the A591, travel through the town centre taking a right hand turn onto Church Street. Turn right at the junction onto Compston Road. Half way up Compston road turn left before the Pedestrian crossing, onto Millans Park. Take the second left onto the one-way system and follow it round to the right. Brantholme is signed on the left hand side, with the car park immediately as you drive in. By car - travelling North on the A591, follow the signs for Ambleside and at the first set of Traffic lights, turn left on the A5075 (with Ambleside pier on left) and follow this road into the town centre remaining in the left lane (at the pitch and putt) leading on to Compston Road. Half way up Compston road turn left before the Pedestrian crossing, onto Millans Park. Take the second left onto the one-way system and follow it round to the right. Brantholme is signed on the left hand side, with the car park immediately as you drive in. Public Transport - Main line train to 'Oxenholme - the Lake District' and change for 'Windermere'. Either get a taxi from Windermere station or the 555 bus (or open top bus if in season) to Ambleside town centre.